Last year I was lucky enough to gain a charity place in the Virgin London Marathon (VLM) and I remember the high from that day, like it was yesterday. I can recollect all the training that I completed, collecting my number from the expo and the enormous amount of excitement that I felt the week before the event. I felt real disappointment back in October, when I found out I had not got a ballot place for VLM 2016, but I decided to sign up for the Paris marathon instead. Paris 26.2 was awesome! A beautiful city, with great weather and fabulous supporters. I managed to drag most of my family and friends out there too, a cunning piece of marketing on my behalf! ‘Why not come to Paris for a weekend break and watch me run?’ Why not indeed! They all boarded the Eurostar, then cheered me on and we had a fabulous time together before and after. As my friends collected their numbers for VLM from the Excel in London, I suddenly became envious of what was in store for them. How can anyone be envious of running 26.2 miles, you may ask. Well to sum it up, it's the atmosphere, the sense of being part of something huge, the build up on social media and the whole feeling of love and community that surrounds it. The BBC treat it like an old friend and Paula Radcliffe’s World record & course record of 2hr 13 mins still stands strong from 2003. Watching it from the comfort of your own sofa you can’t help but be inspired. Having watched it myself from home for many years, this year I decided to go and support and I’m so glad I did! The atmosphere is electrifying, cheering the runners on and shouting out their names felt like a release from all those envious thoughts! We were located at mile 9 with a great view, getting there early we managed to see most of the action from the start and as the wheelchair race whooshed by, it was clear the weather was perking up and wasn't going to snow as predicted. The next group to run past were the ambulant athletes and the visually impaired runners with their guides. The elite men flying past. Then the elite women zoomed past 9 miles in 48 mins!!! Wow! They were followed by the elite men who passed in 41 mins! The masses were not far behind. The charity runners started to pass us and I clapped and whistled, cheered, shouted names and nearly cried! It was very emotional to say the least! I spotted Iwan Thomas and Dame Kelly Holmes amongst the thousands of runners and kept my eyes peeled for 4 other fellow runners that I knew. The fancy dress and costumes worn were stunning and I take my hat off to the running rhinos, the dinosaurs and the storm troopers, they look so heavy and impractical to run in! I did manage to catch a glimpse of my 2 friends but they didn’t hear me screaming their names, but I was glad they were still running and they looked happy. Respect for those runners in dinosaurs, rhinos and minion costumes. a Barry, a Sheila, take a selfie with a horse costume behind you and high five the Grim Reaper! It was the best game ever and it kept her son enthralled for nearly 4 hours. They were a real insight into what the London Marathon supporters are all about, cheering everyone on and loving the day! I told them I would be running it again next year and they agreed to meet my other half at exactly the same point in 2017 with a new improved marathon bingo game and to cheer me on with a big sign that would read “ Go Brenda Go”. It was so emotional watching everyone's journey, it took me back to 2015, when upon seeing my girlfriend at mile 9 I felt emotional, yet surprisingly strong! It was only when I saw Big Ben that I was finally convinced that I would finish! The volume, from the crowd cheering increased and I raced across the finish line achieving a new personal best of 4hr.28! 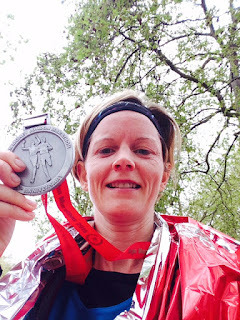 I was over the moon and even after 26.2 miles I felt invincible and didn’t sleep for 3 nights! My marathon journey started in 2014 and it had not all been hugs and puppies! It had been hard work, true grit and determination coupled with pure stubbornness had got me through Brighton in 2014 and I vowed never to run another one again! The attention I received as a broken runner in Brighton is the only thing that got me across the finish line and I wish I could say thank you to all those random strangers that took time out of their lives to cheer me on. It was time to pay it back! Genuine kindness and encouragement was the name of the game and I was in charge! Instead of moving onto Canary Wharf, we decided to stay and cheer all the runners coming through until the end. Most spectators move on to the finish once they have seen their loved ones, which leaves the course empty of supporters for the last of the runners, not great when you need a boost. So we whooped, clapped, cheered and shouted out names til the very end, I didn't know these runners but I remember thinking how amazing the London Marathon was last year, I wanted to give them my full support and reassure them that they could finish it. Random strangers shouting out your name, kids giving you high fives and people giving you jelly babies and support, is exactly what you need to get you through the long miles of a marathon. Given half a chance I would have walked or run beside some of the runners, chatted to them and told them how amazing they were doing, however, my barrier jumping days are over and the marshalls were still about! The last of the last runners passed us, so we decided to call it a day and head home. It had been such an awesome experience and although I was gutted to not have taken part myself, I came home feeling just as high as I did last year! Although, thankfully I did manage to sleep that night. I should never really feel envious of something I have already had the honour of experiencing. Supporters are not just random strangers, they are friends you just haven't met yet. Marathon bingo is the best game ever! Watch this space for the the next big challenge! !